Gary Sharpe, left, is one of 17 sports figures associated with Nevada Union set to enter the school's Hall of Fame. The girls basketball team was dominant as it earned multiple section championships, the football team rose to new levels and won a pair of section titles, and Nevada Union athletics in general thrived. It was good to be a Miner in the ’90s. “This was really the beginning of a golden era of Nevada Union athletics,” said Jeff Dellis, NU’s athletic director. Seventeen athletes, coaches and contributors from that era are set to be inducted into the Nevada Union Athletics Hall of Fame April 28. Leading up to the induction ceremony, The Union Sports Editor Walter Ford will be taking a closer look at the 2018 inductees and what made them hall of famers. It’s a 17-part series beginning in Tuesday’s sports section with legendary football coach Gary Sharpe, and will feature a different 2018 inductee every day until the induction ceremony at the end of the month. 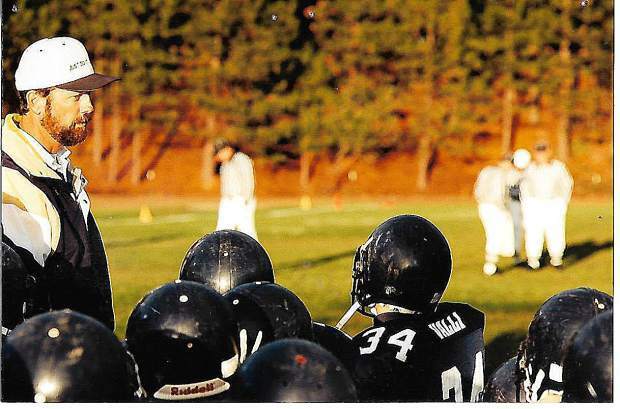 Sharpe coached junior varsity and freshman football at Nevada Union for 36 years, putting together an eye-popping record of 311-37 overall, including 24 league championships, 13 undefeated seasons and a streak of 97 straight league wins. Other inductees that will be featured include Craig Strohm (coach), Mike Bratton (community contributor) as well as 14 former athletes including: Amy Atkins Barber (class of 1995), Matt Beck (class of 1995), Kellie Cook (class of 1991), Brian Dwyer (class of 1997), Paul Gross (class of 1999), Kennon Heard (class of 1984), A.J. Kunkle (class of 1994), Brandon Lampe (class of 1996), Brieanna Lampe Hull (class of 1998), Thor Larsen (class of 1994), Matt Massari (class of 1998), Isaac Ostrom (class of 1995), Pete Phelan (class of 1979) and Tim Trokey (class of 1991).